Vance, Norton and Watts have escaped the Russian forces pursuing them. Following the hidden path into the heart of the mountain they search for a way to safety, but first they must find a way past the colossal monolith in front of them. Well here we are, at the finale of what has been, for me, an excellent mini-series that exemplifies the art of Lovecraftian storytelling. 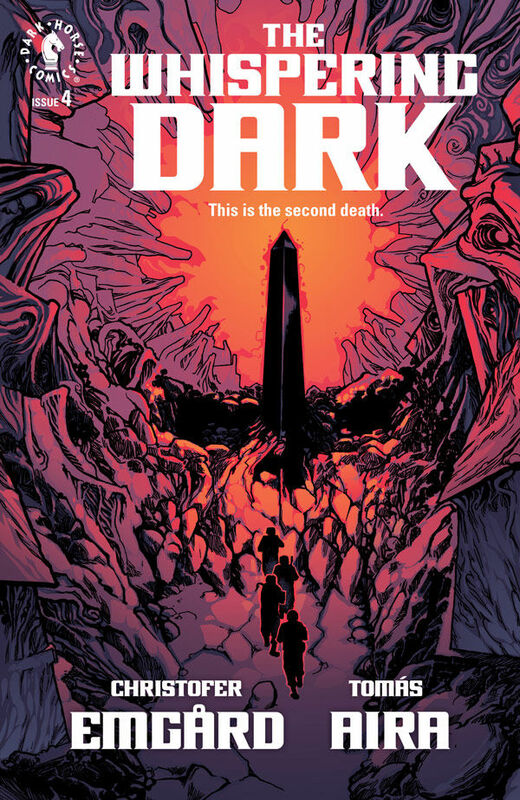 Over the last four issues, Christofer Emgård has written a wonderful story that has built the tension page after page, issue after issue with the kind of insidious creeping dread that you can only get with Lovecraftian fiction. Even in this final issue there is so much ambiguity about what is real and what is imagined, and about just how much of what the team has been through actually happened. Is this the fevered imaginings of Vance’s shell-shocked mind, mental demons created as a reaction to her religious beliefs, or is it truly the twisted projections and evil machinations of a dark entity that has been dogging their every step? As with Emgård’s narrative, Thomás Aria’s artwork has been superb from start to finish. I’ve said this before in previous reviews of this title but the world that Aria has created is stunning in its ability to make vast landscapes seem so claustrophobic and imprisoning. His depictions of the players in this story are of course wonderfully executed, but for me, the world they are fighting to survive is the real star here. As I’ve previously discussed, there are so many parallels with H.P. Lovecraft’s original works, and they are more vividly depicted in this issue. There are very obvious nods to At The Mountains of Madness, The Call of Cthulhu, Dagon, Night Gaunts. The final issue in this mini-series is much more clearly supernatural in the way Aria presents the story, than the previous issues, although for me, this just serves to heighten the questions over what is real and what is a projection. The Whispering Dark has been a highlight in my reading list over the last few months and I’m going to be sorry to see it go. Whilst there is a very definite end to this story for Vance and the team, like all good Lovecraftian stories we are left with an ending that is the beginning of something much darker that allows us to continue past the edges of the story in our own imaginations. If you haven’t picked this up yet, I’d highly recommend grabbing all four issues of this series while you can.